This is the first UK solo exhibition of Shanghai based Ji Weiyu and Song Tao who collaborate under the name of Birdhead. Their youthful and rebellious spirit, the savvy way in they operate and their highly collaborative approach have made them a respected presence in the Shanghai arts scene. 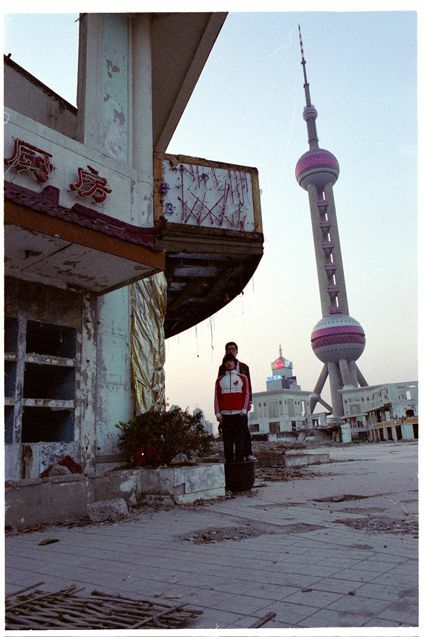 The two artists grew up in Shanghai in the 1980s when mass urbanisation began in China. The frenetic pace of change in the city, one which leaves no time for questions or hesitation, is conveyed by the spontaneous and accumulative aesthetic of their work. Working in photography and video, with a highly improvised and self-contained approach, Birdhead take snapshots of their everyday lives and their surroundings. Their subjective and un-retouched take on urban reality captures not only a local cultural identity, from a native inhabitant's point of view, but also invokes the physical experience of being in Shanghai, the relationship between the body and the city. Ji Weiyu and Song Tao were born and live in Shanghai. Recent exhibitions include China Power Station II, Astrup Fearnley Museum of Modern Art, Oslo, Norway, Birdhead Photography Show 2006-2007, BizArt, Shanghai, China and Individual Position II, ShangART, Shanghai, China.